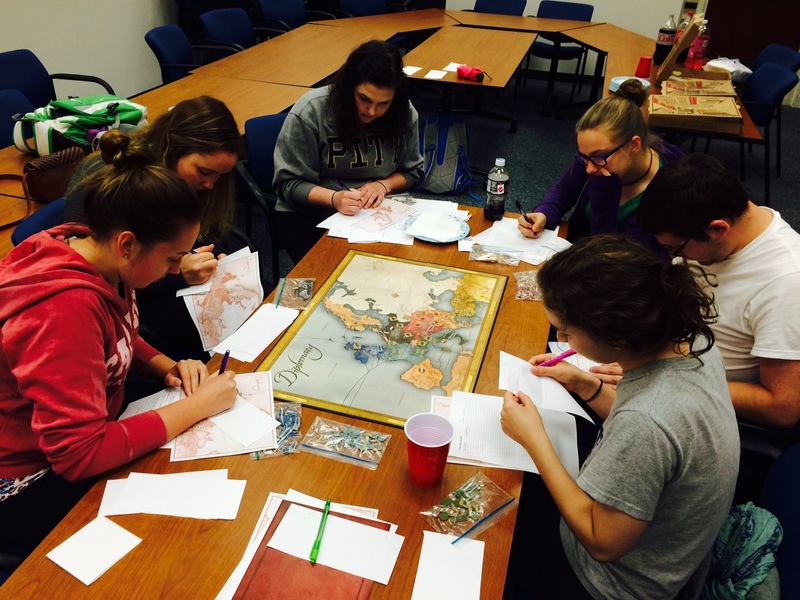 A bit more painting and another game. A bunch of us decided that with all the newer players in the area, a Journeyman league was just the ticket for all of us to “start new” together with them. So my painting of my new-ish Trollbloods force is going to be slowed for a while. I did manage to add one more piece before this game: the Fennblade Officer UA. Great pose and model, and I’m pretty pleased with how he turned out. 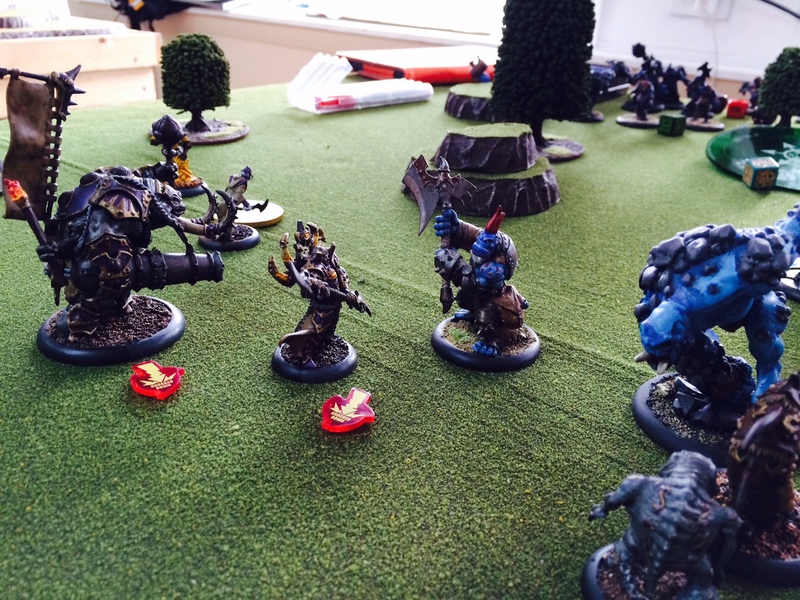 For the game, I faced off against a new foe (Ben) and his Cygnar force led by Stryker3. His 50pt. army had a Reliant for a warjack, supported by the usual Cygnar support personnel. On the units side, there was a big unit of Precursor Knights, a big unit of Sword Knights, and a unit of Storm Lances. The group was rounded out by Aiyana and Master Holt. My force was Jarl Skuld run pretty beast-heavy with an Earthborn Dire Troll, a Dire Troll Blitzer, a Storm Troll, a Swamp Troll, and an Impaler. They were supported by a max unit of Fennblades with UA and a min unit of Fennblades, two sets of Troll Whelps (one on the table at the start, one inside and waiting to pop out), and Janissa Stonetide. The mission was Fire Support, which has both flags and objectives, and the Cygnarians got the first turn. Jarl Skuld’s feat came very early, to prevent my opponent’s cavalry from crashing into my lines. The more I play Jarl, the more I dig him. He’s got the things that I find too many of my other casters lack: denial, control, and spot removal. Now, maybe that’s because I’ve been playing more Skorne than anything else in some time and I run casters and models that aren’t exactly invested in denial and removal–so Jarl is just a refreshing change of pace. 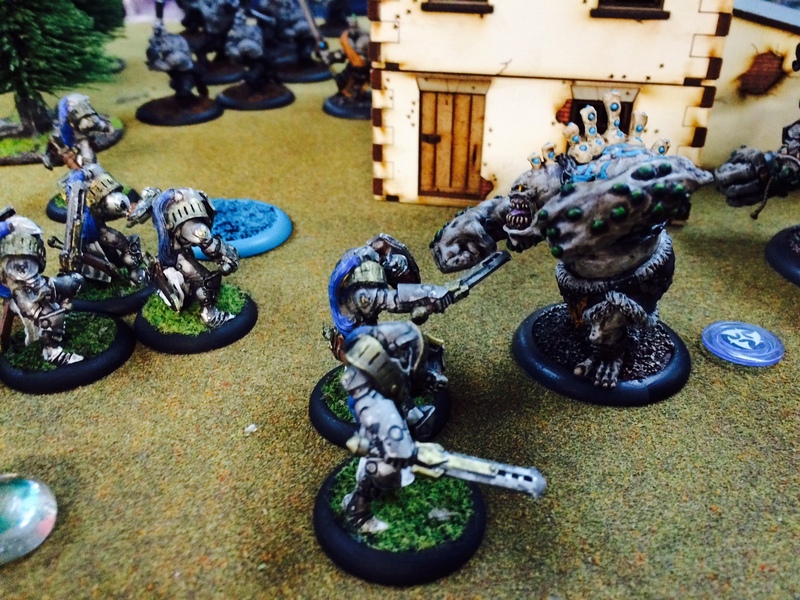 This battle against Cygnar was pretty evenly matched through most of the fight. I didn’t work my charges as carefully as I could have, and my Storm Troll ended up just short of his target. Yet I was slowly advancing the piece exchange with Jarl Skuld getting a lot of the job done himself. Finally the Cygnarians reached my lines thanks in good part to a critical feat turn from Stryker clearing good openings. Jarl was left generally under-defended and low on fury. He had to scrape off his fury to transfer the ranged shots that managed to hit him, leaving him facing a dismounted dragoon and a trooper. The Dragoon failed to seal the deal due to mediocre rolls, leaving it all to the charging trooper model. My opponent merely needed to roll a hard 5 or more to finish Jarl… and failed. He should have by all rights been dead twice over at that point, but had gotten away with it by the skin of his teeth. My retaliation was quick and brutal, as very little cannot be solved by a judicious application of the Earthborn. He took Stryker3 out, thanks in no small part to his Adaptation rule. 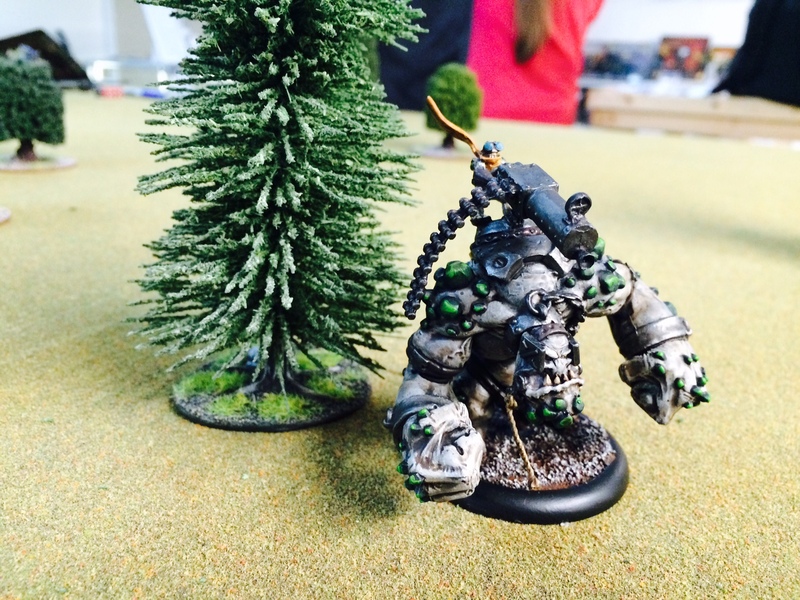 With such a high power score on Stryker’s weapon, the Dire Troll hit like a truck and finished him off quickly. Overall it was great game. Definitely one of those games that I should have lost, but the dice chose otherwise. Jarl managed to dodge and weave his way to success in the face of failure. Another great game on the opponent side as well, as Ben was a really friendly opponent who definitely had me outclassed on the tactical side. I find I learn so much from playing players who know so well what they’re doing with their lists. I’ve done the reading and thinking about the Stryker3 method and list, but nothing beats seeing it in action demonstrated by a skilled player. 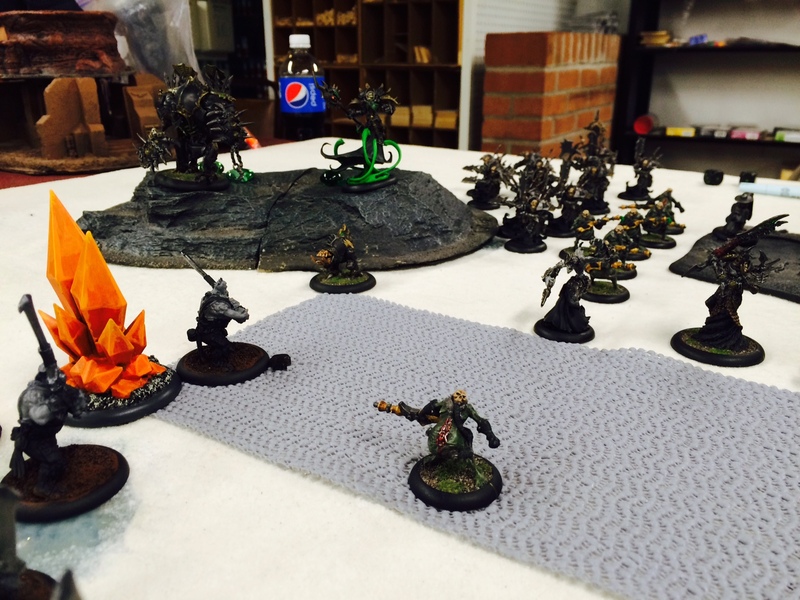 A number of my prior posts have mentioned that I and my buddy Dan have been preparing for a Warmachine/Hordes 50pm team tournament. So this past weekend we made the journey over to Legions Games in Pittsburgh, PA and took part. 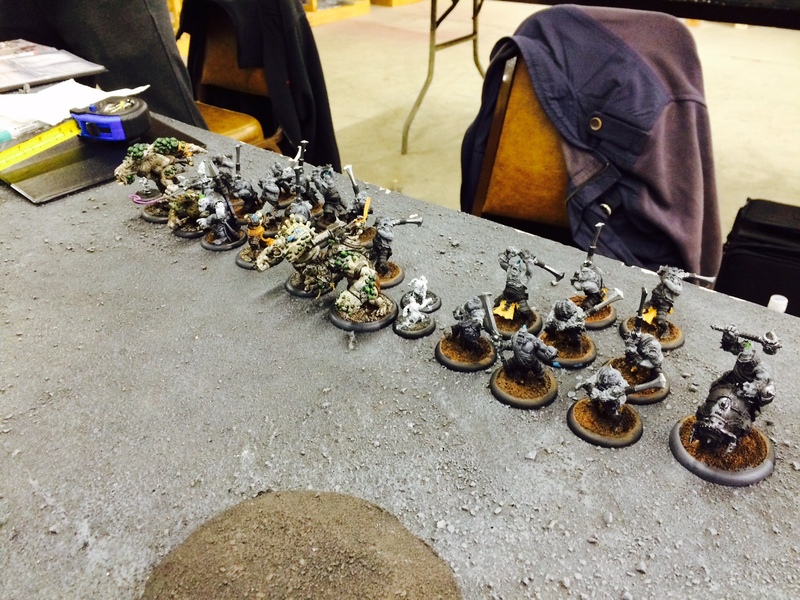 Dan fielded his Retribution of Scyrah forces, while I took a chance and went with my Trollbloods instead of my Skorne. The tourney was general Steamroller format, with each teammate submitting two lists. Dan ran a Kaelyssa Force Wall tier 4 list and a Thyron all-comers list. I ran with a Madrak2 End Times tier4 list and a pretty similar variant list overall with Jarl Skuld (same warbeasts, different solos and troop UA location). My lists were admittedly limited because I’m newer to the faction and haven’t acquired all the models I needed, so I had a bit of a split list problem. For the team tournament, each team was paired with another team and had their player A’s match up against the opponents’ player A’s (with B’s in the same manner). Once per tournament you could choose to swap and have A-B and B-A, and once per tournament you could pause the timers (52 minute rounds) and confer strategy with your teammate. 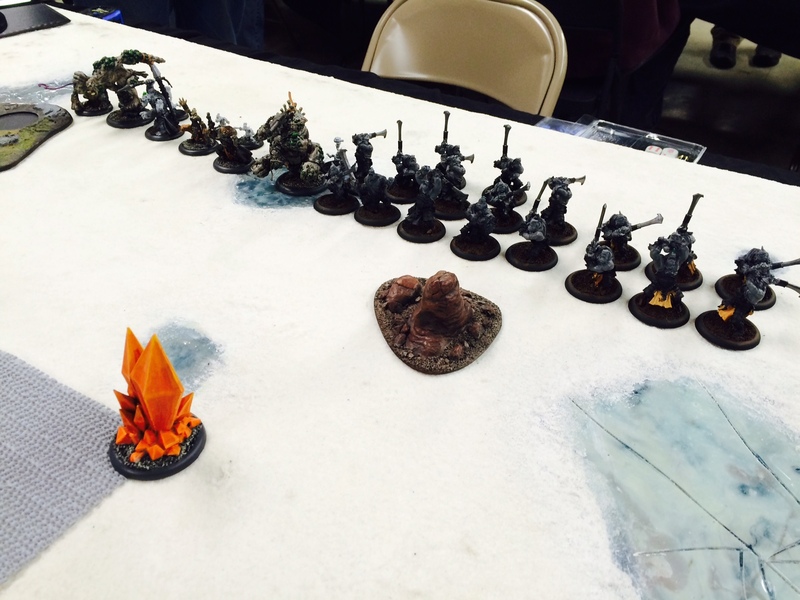 First round we got paired up against a Khador (Butcher3) and Cryx (Gaspy2) team. That meant an uphill slog for both the Trollbloods and Dan’s Retribution. I chose to go with Jarl Skuld to give me some measure of protection from Gaspy’s feat if I played a bit back, and the ability to project some removal into his backfield and threaten with range and speed. My foe’s Asphyxious2 list was pretty standard stuff: Deathjack, Cankerworm, and an arc node, big units of Bane Thralls and Bane Knights, the necessary Bile Thralls, and some supporting mercenaries in Gorman and Saxon. He got the first turn, and the mission was Destruction. Ah, distance, my old foe. I knew to be ready for Excarnate. I thought I had range of relative safety and a tasty enough lure closer to my objective. Yet a few Trollkin Fennblades died foolishly from it anyways. Bringing a new Bile Thrall so close simply hurts. I got fairly lucky in some rolls and movements of my foe, and landed more than a few points of damage on Asphyxious in the clash between some fast-moving Fennblades and the ever-reliable Magic Bullet spell. With Gaspy2 engaged by two Fennblades, I was hoping that Jarl’s Fog of War would postpone the feat turn by a round and I could go for an assassination myself. Aspyhxious counted on bad troll melee rolls, and was rewarded. Even with the bonus for free striking he managed to escape combat intact and reach close enough to bring back his spectral army inside the clouds–allowing them the charge on Jarl. And that spelled goodnight for my round one. I was pretty proud as I had hurt Asphyxious pretty well (if one of the two free strikes had been pretty lucky at the end it could have gone my way), and I at least earned one control point for my team’s record. Plus, my opponent Vic was a great guy. Really fun to play with and with good spirit about the game. Not to mention a lovely and classic theme Cryx force. 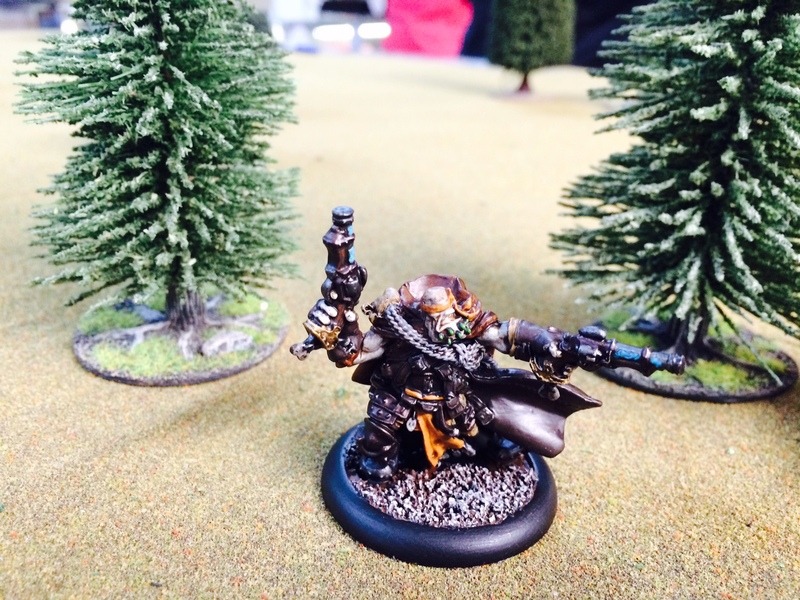 On the other side of the team, Dan’s Retribution had played a close game as well–unfortunately attrition against Khador didn’t end in the elves’ favor. So we fell to zero points for the first round. At least our second round foes would be in the same boat! For round 2, our pairings were me facing against a Cygnar force and Dan facing off against an Everblight list (an unappetizing menu of either the Twins Saeryn and Rhyas or Abyslonia2). As I had more experience with Everblight, we decided to use our team feat and swap it around–ending with Dan and his Force Wall facing Stryker3, while my Madrak2 End Times tier list would go against the Twins. 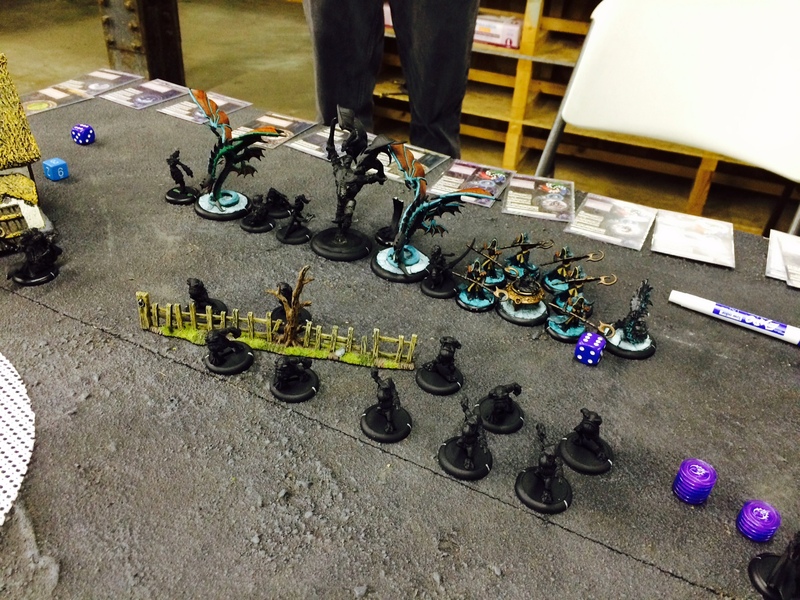 My opponent’s force was the usual icky tournament fare of Everblight. I try to always remind myself that every army is potent, but somehow the hugeness of the heavies in Everblight seems oppressive. With two Angelius warbeasts and Zuriel, that sense of massive looming doom was all the more increased by wingspan. The rest of the force was a Cauldron and a Naga, a Spell Martyr, a Strider Deathstalker, and a unit of Croak Raiders. Mission was Outflank, so we had two big zones of scoring to contend with. 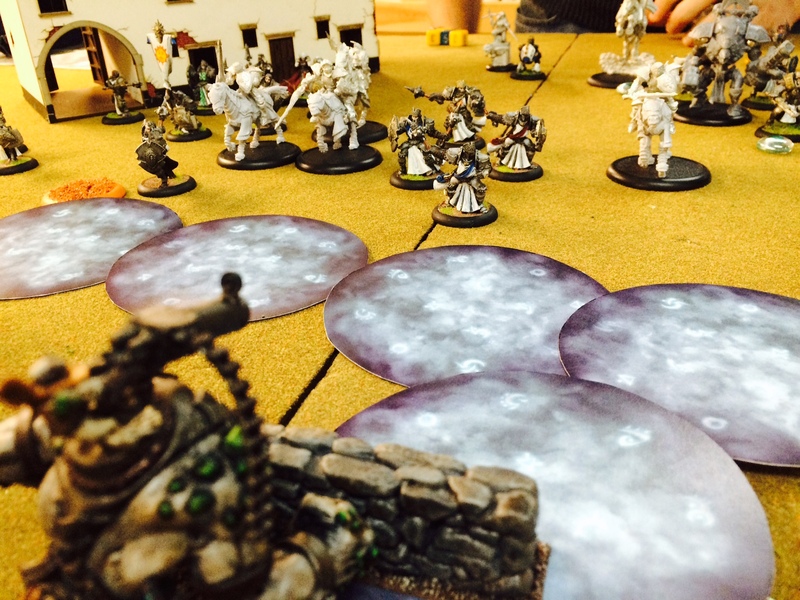 The Cauldron and a poorly-chosen charge target were the two big mistakes for me in the match. I engaged the beast side pretty well, and panicked the Croak Raiders who took multiple turns to rally. I let too many little shredders spawn from the Cauldron, though, as my ranged support was on the wrong side of the table. And the Earthborn ended up nearly useless for the match because I charged a poor target that left him out of position to really make much impact. Madrak2 did pretty well for me overall, and I had a chance at taking the match. I suffered the alpha strike of Rhyas, killed her, then suffered the revival and killed her again. While things were getting thin for my forces, it was hardly over. 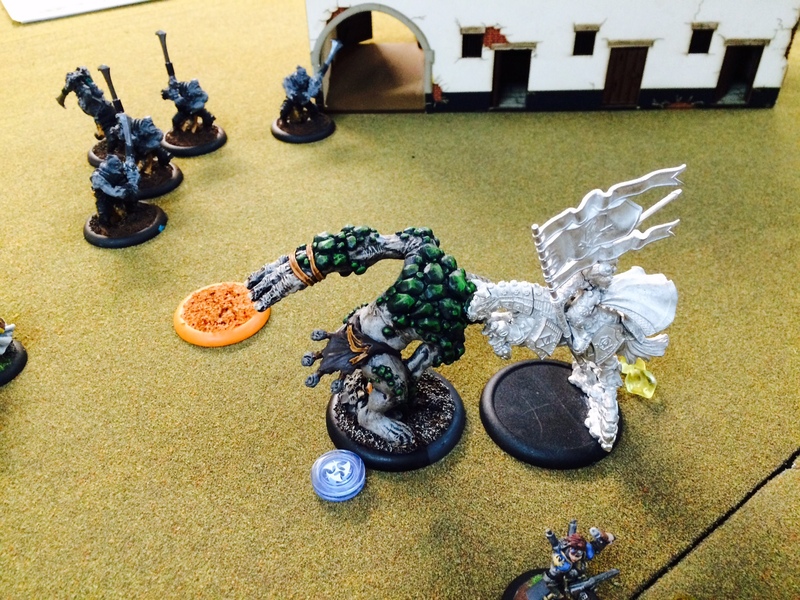 Madrak had the best shot of it, getting two throws of his axe on his feat turn, with focus to boost the to-hit on each, against Saeryn. She was in a very good defensive position, but I needed high doubles anyhow–Critical Grevious Wounds would have meant that she couldn’t transfer the hit away. Alas, my aim was off both times and he missed with each. The rest of the ranged attacks I tried to land on her had fallen pathetically short. With dwindling protection (and lit on fire from two turns prior), Madrak was indeed on his End Times. Clearing the last of the Trollkin around him with the Deathstalker, my foe moved the Angelius in for the successful kill. Again, a great game and a really fun opponent. 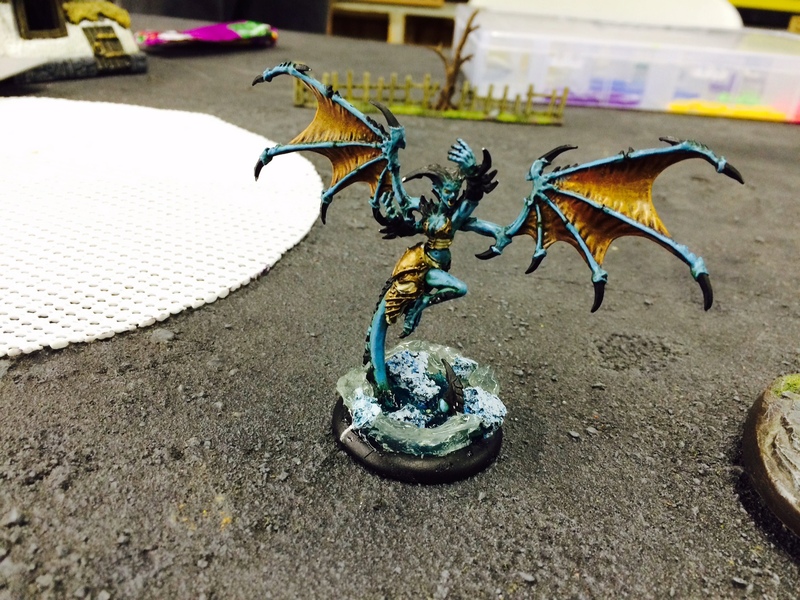 David was a fun player, and his finished models looked great (I didn’t face his Absylonia2 list, but she looked so great with a cool whirling-water base I included a pic of her below). 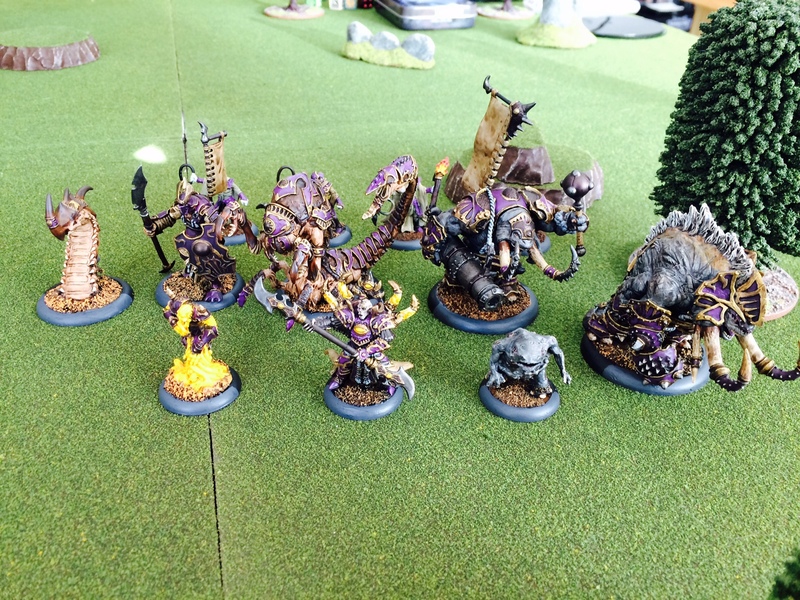 I could have done better if I remembered a few things, but I reminded myself that I’m horribly new at Trollbloods–my Skorne or Everblight may have been the better choice for the tourney setting. On my teammate’s board, Dan and his foe Ben were having a rollicking clash. Ultimately, it came down to death by clock for Dan–his time ran out. He was in decent position for the game, but the sheer number of activations that the Force Wall list includes got the best of him. With us falling at two losses again, we ended up seizing the Third Round Bye. Which was generally fine with us both. We’d done well, and were pretty close in all our games. A little mistake here and there, plus some dice luck, is often the difference between top and bottom at an event like this. 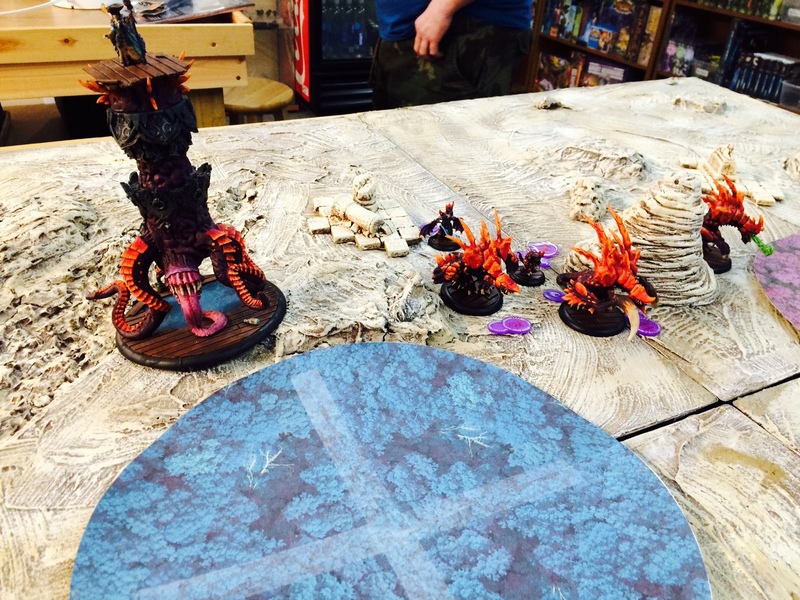 All in all it was a great tournament, with some really well-painted stuff (Dan’s first round opponent, Justin Shannon, gave me permission to share his awesome Ruin and Butcher3). It always impresses me at how quickly people can paint such gorgeous forces–I’m excited to see what everyone has added by the next month. 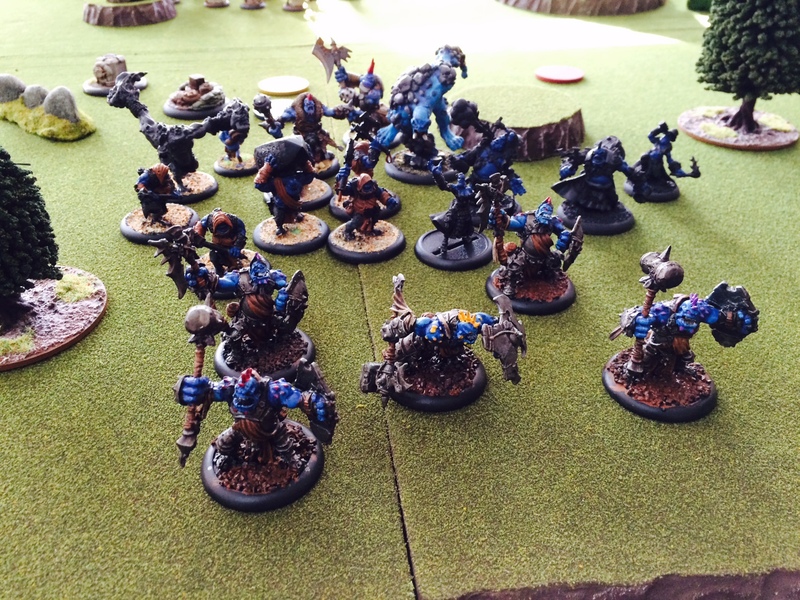 As I’ve mentioned before, I’m getting pretty heavily into a Trollbloods army. I added two more models to my painted totals for this week, and snuck in a small-sized game of Mangled Metal/Claw and Fang against a player who is just starting up a Cryx force. It was perfect timing, as he was fielding Lich Lord Asphyxious, while I painted a new warlock for my force: Jarl Skuld. They make a perfect pairing for a duel in the Thornwood–no doubt some members of a Trollkin Kriel stumbled upon a hidden necrotech factory. 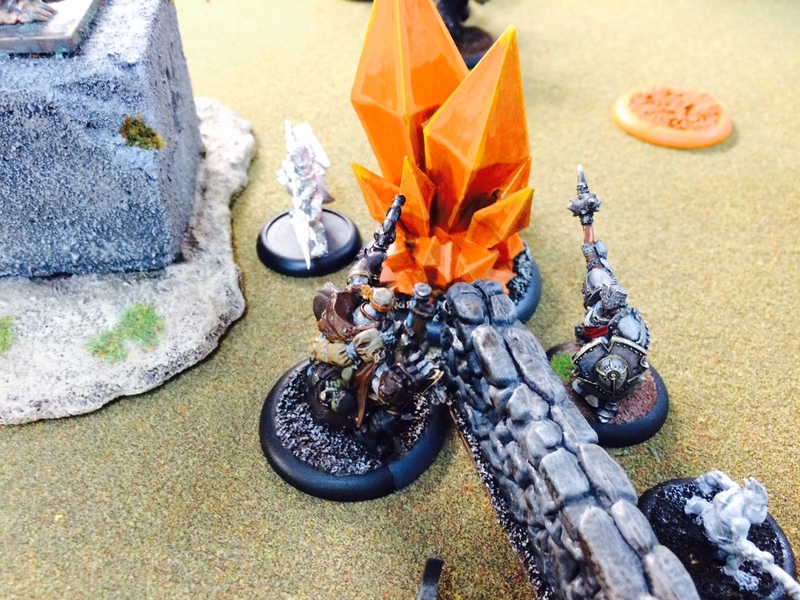 As Jarl Skuld rushed the place with a few of his Dire Trolls, Asphyxious, a Helljack, and swarm of Bonejacks found a stalling defense action–hoping to take Jarl Skuld down. In addition to Jarl Skuld, I painted up a Dire Troll Blitzer to add to my force. I just love the look of the model, so I had to run one. They may not be the perfect warbeast, but they can sure dish up a lot of attacks with a lucky turn. Plus, the pyg gunner atop the model makes me laugh whenever I look down at him. The battle itself was relatively quick, as small Mangled Metal/Tooth and Claw bouts tend to be. 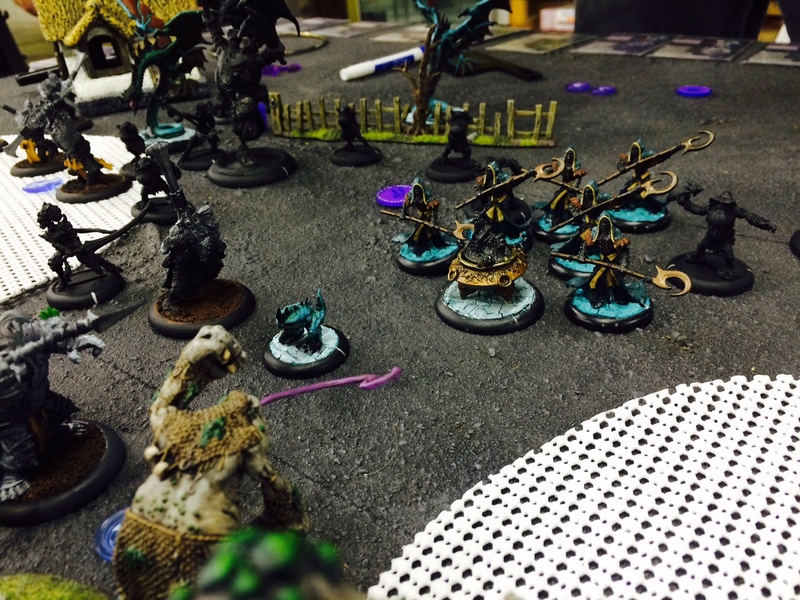 The Cryx harried Jarl Skuld somewhat early on, with spells and a spray attack from a Defiler. The Trolls for their part answered in kind–bonejacks are flimsy, fragile things. Especially with an Earthborn Dire Troll absorbing their high power weapons and turning them against your forces. The Cryx jacks managed to kill the Blitzer relatively quickly, while Asphyxious blasted away with spells and feat, hoping to finish it off and win the game. He got very close, but not close enough. The Earthborn turned and sunk its meaty claw right into the last remaining Cryx warjack–winning me a victory when it was destroyed. While it was a small game, it had been a fun one–with each of us using very different tactics to try and wrestle a win. It’s tournament season! 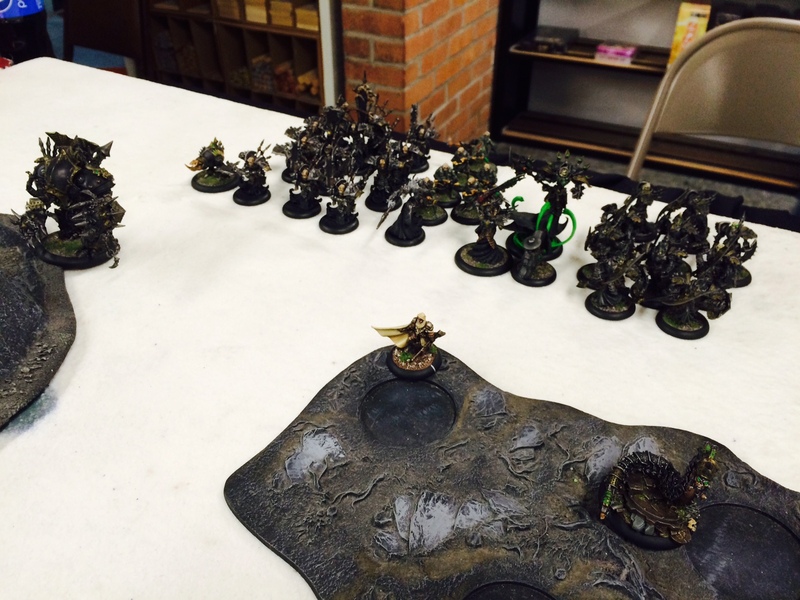 Something about November apparently means that every place I game is hosting Warmachine and Hordes tourneys. 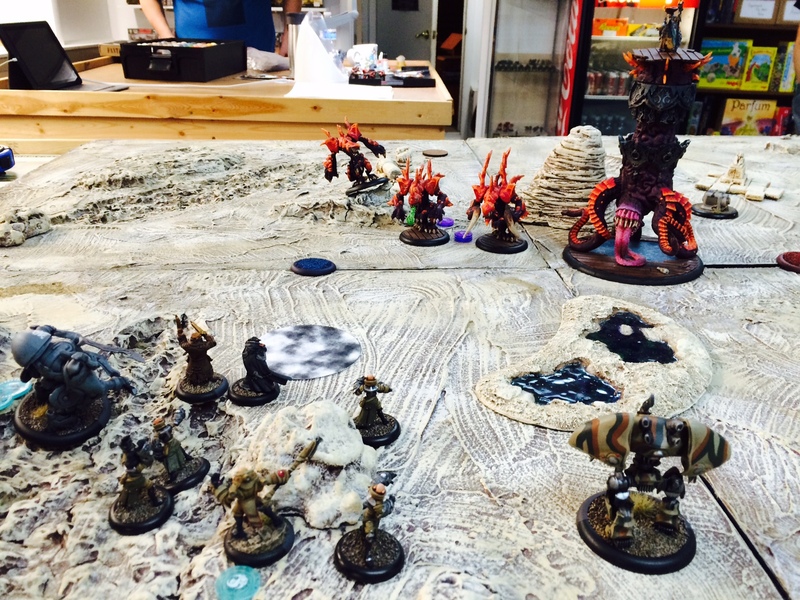 The first one was at Drawbridge Games, a 35 point three-round tournament with variable missions chosen from the Steamroller 2015 pool (each table rolled randomly at the start of each round). 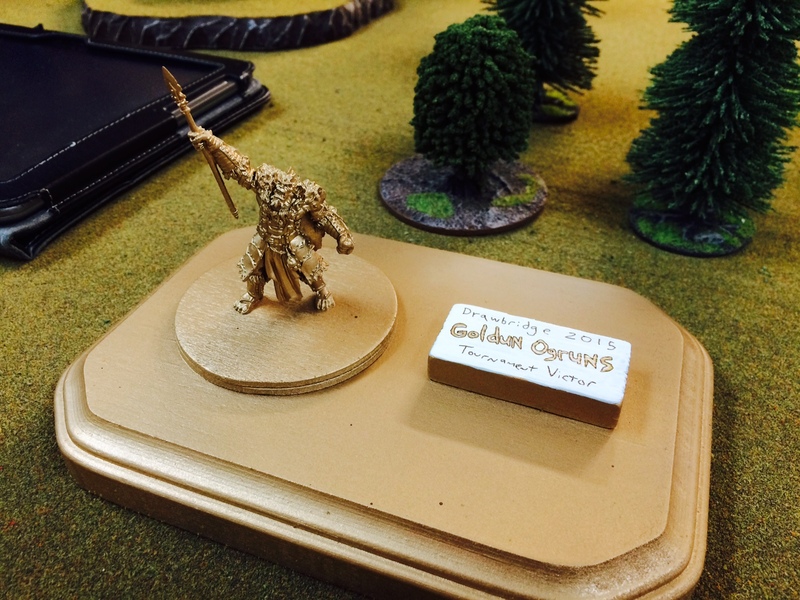 The tournament was dubbed the Goldun Ogruns 2015, by me, as I was the one who made the trophies by cobbling together a few pieces of display wood, some metallic paints, and a commandeered set of Blighted Ogrun Warspears from prize support. With three trophies on the line: Tournament Winner, Best Painted Army, and Best Painted Model, I was excited to get some games in! My 35 point Skorne force for the tournament. I went with Hexeris2 and a warbeast heavy approach. It includes the Bronzeback, a Cannoneer, an Aradus Sentinel, a Cyclops Brute, and my favorite model for Hexeris’ bonded channeler: the Razorworm. Rounding out the force were some Beast Handlers, an Agonizer, and a Void Spirit. The force is pretty general, relying upon his Black Spot to enable my shooting beasts to do their damage on enemy forces as they arrive, and the arc node, Bronzeback, and in a pinch Hexy or the Void Spirit to be the threat vectors for the enemy casters or specific model removal. I knew that this force would struggle with scenario points unless my foes were smaller in size and/or lacked the magic weapons/spells to deal with the Void Spirit, so I kept caster kill at the front of my mind in games. 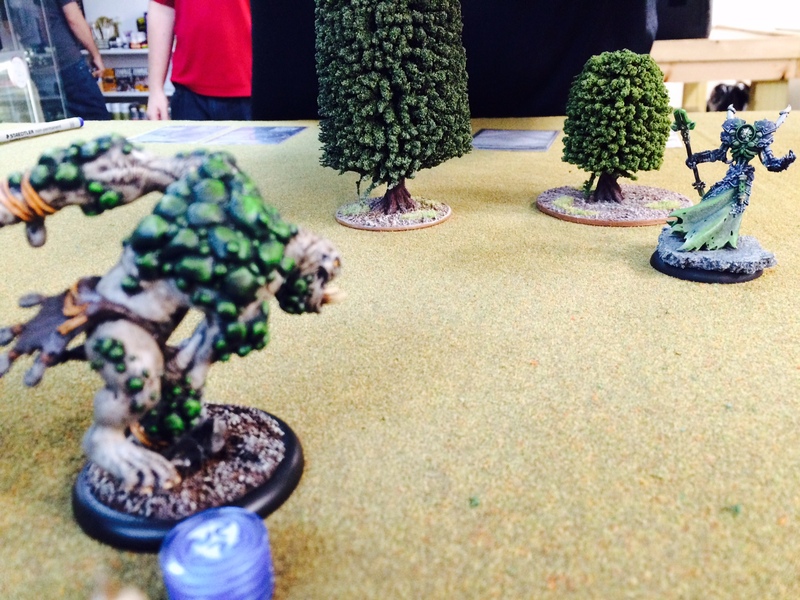 My first matchup was against Tony’s Trollbloods. 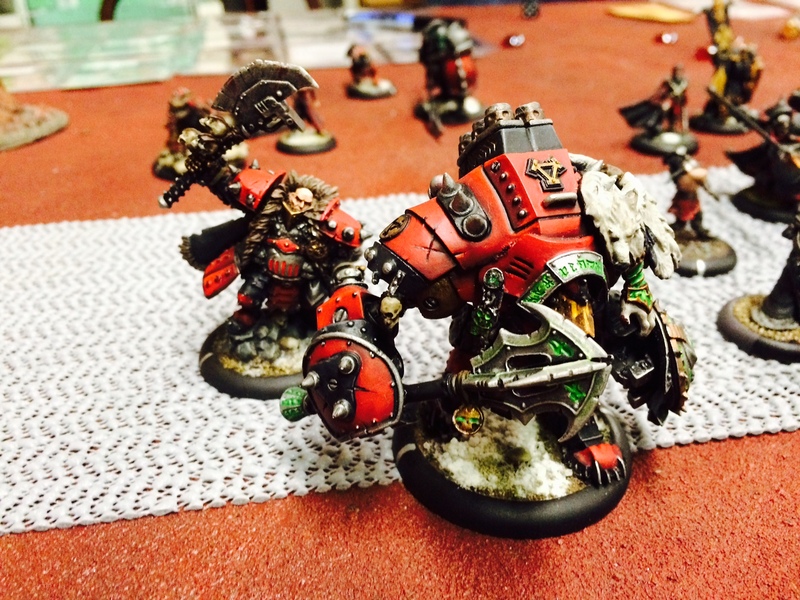 They were a solid list of Warders, Krielstone bearer, and Northkin Fire Eaters, backed by Janissa Stonetide. 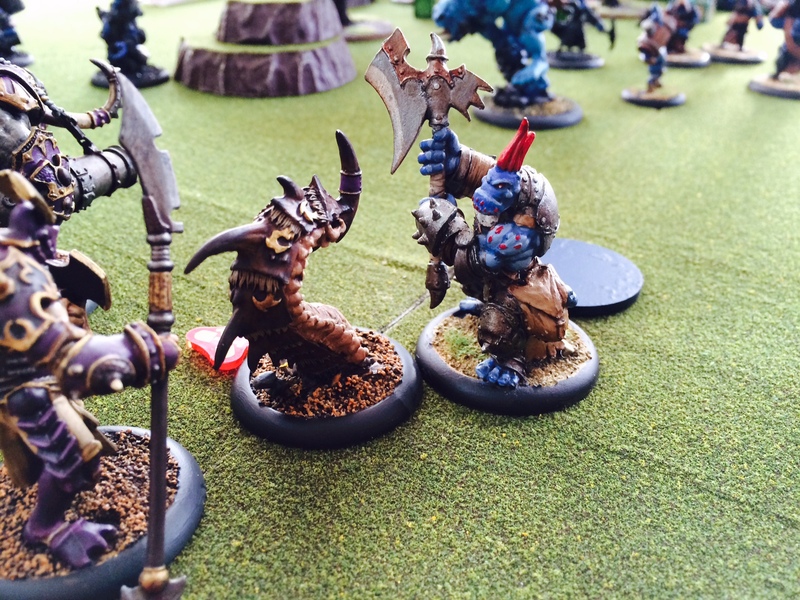 The Warlock was Borka1, with an Earthborn Dire Troll, a Troll Axer, and a Pyre Troll as his warbeasts. 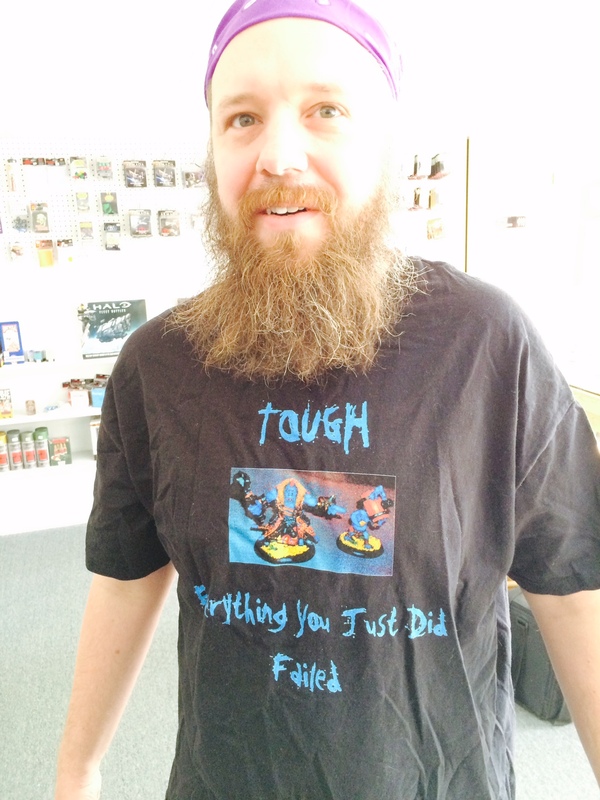 You know you’re in trouble when the person you’re playing against is wearing a shirt with a picture of his own painted model that you’re facing! This was going to be an uphill battle. The Troll of the match proved to be the Troll Axer. It got an initial lucky charge in by a squeeze–just slipping completely past the flag marker. That locked me down in the middle. While I was getting lucky on my right flank (the Warders were inexplicably missing my Paingiver Beast Handlers that I had to draft into emergency speed bump duty), my own actions led to my demise in the center. I enraged my Aradus Sentinel, only to find that Borka ended up on the subsequent phase with his back to it. It would have been a perfect back shot with poisoned weapon, but sadly the Enrage compelled him to charge or slam so he slammed the Axer out of the way of my other models to set up spell and ranged attacks on his caster. The critical mistake was not remembering the difference between Hordes and Warmachine for a moment when it came to my Agonizer. I was counting on its cries of baby elephantine misery to prevent forcing… but no, it prevents allocation of focus to Warjacks but only turns of the animus of affected warbeasts. I had forgotten, and it cost me. The Earthborn two-handed threw the Cannoneer right through Hexeris, leaving both knocked down. 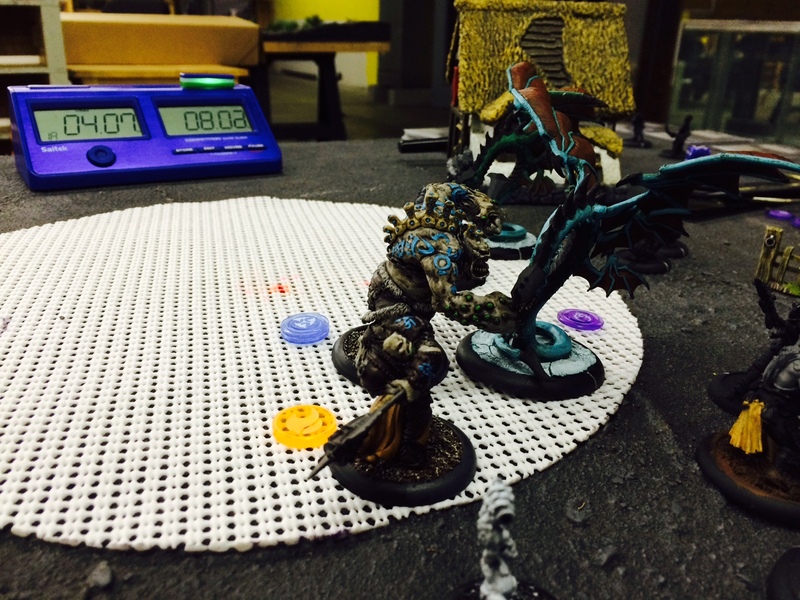 Then the Axer simply forced his stand up and rolled in to finish my Warlock with ease. I don’t want to take anything away from my opponent with this, as he played a great game that kept me really on my toes. 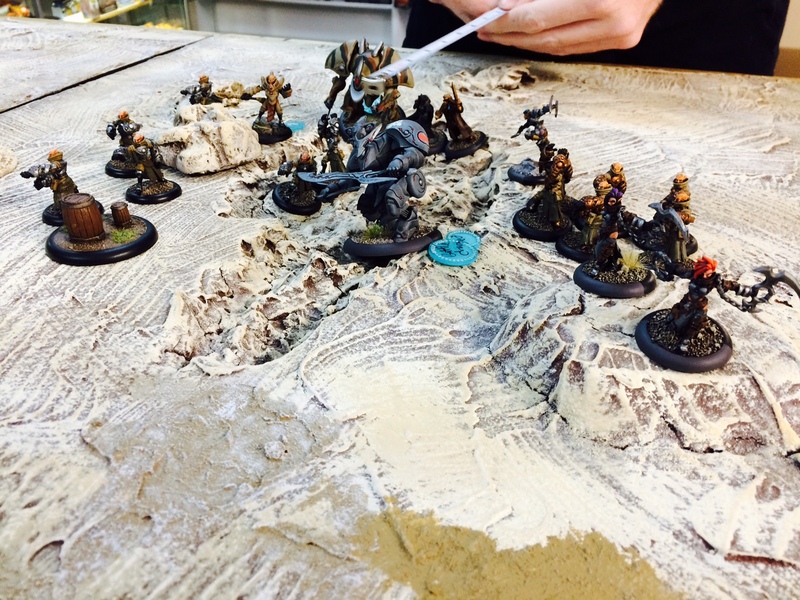 It was a tough assassination to set up even if I hadn’t blundered on the Agonizer. All in all a very fun game. My second round draw was against Kevin and his Puppet Masters Mercenary Contract list. Headed by Exulon Thexus, the list was three big groups of Drudges, a number of Cephalyx Agitators, a Pistol Wraith, and two of their Heavy Monstrosities. My Advance Deploy warbeasts got up field as fast as the two insectiwurms could scurry, which let Hexeris start unloading his spells through the channeler on turn two, joined by the Aradus Sentinel belching out its poisoned AoE. I cleared a whole lot of chaff in my first turns–using my feat early to get a second casting of Ashes to Ashes off. While the Cephalyx left some dents and dings in my warbeasts, they weathered that storm. Exulon was as sneaky and manipulative as he should be, sliding my melee pieces all over and allowing his Heavy Monstrosities to get advantageous positions. It quickly became clear that I’d need to press the assassination vector, as getting control points was going to be tough given the closeness of objectives and manipulations my opponent was using. The Razorworm was able to chomp its way to freedom thanks to Drag Below, and advance through a gap to leave the Warlock and a Cephalyx Agitator in its sights. Hexeris was then able to use the presence of the close model to shunt AOE damage onto Exulon without directly hitting him (to avoid his Sacrifical Pawn ability to pass hits to nearby Monstrosities). The Warlock had taken the rough end of some Warbeast ranged weapon blast damage on prior turns, so this strike was enough to finish him off. I was pleased with the win, but I managed zero control points for my trouble, leaving me still back in the standings for the tournament. 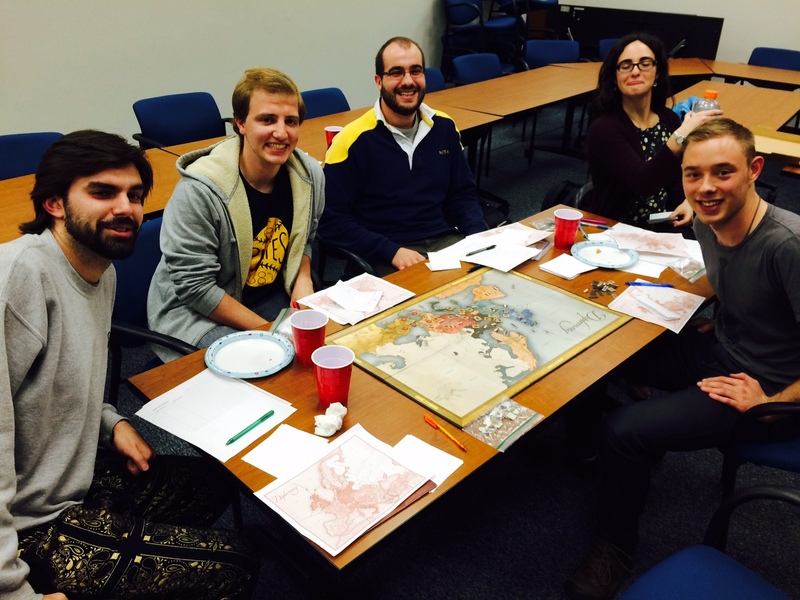 It was a three-round affair, but it became clear at the end of round two that two of the players were ahead of the rest and would be the tourney deciders (due to victories and points)–so the rest of us took a break and watched the “championship” match up. I was glad to see that my opponent from the first round, Tony, managed to win the final “championship” game and the trophy. All in all it was a great little tournament. I need to work out a way to put the squeeze on my opponent with objectives when playing my Skorne. I have a unit of Paingiver Bloodrunners that I’m thinking of prioritizing on the painting table, as a way to put quicker pressure on foes with my Skorne lists (plus they’ll suit Morghoul2 just wonderfully). Even with the advance deploying warbeasts, they’re not speedy enough to really give the scenario pressure I need and they’re further hindered by control range. Until I get that sorted out with the Skorne, my options are limited because I always seem to be the one who’s falling behind in scenario points–a problem which I don’t seem to have with any of my other forces. Soon enough I’ll crack that code. 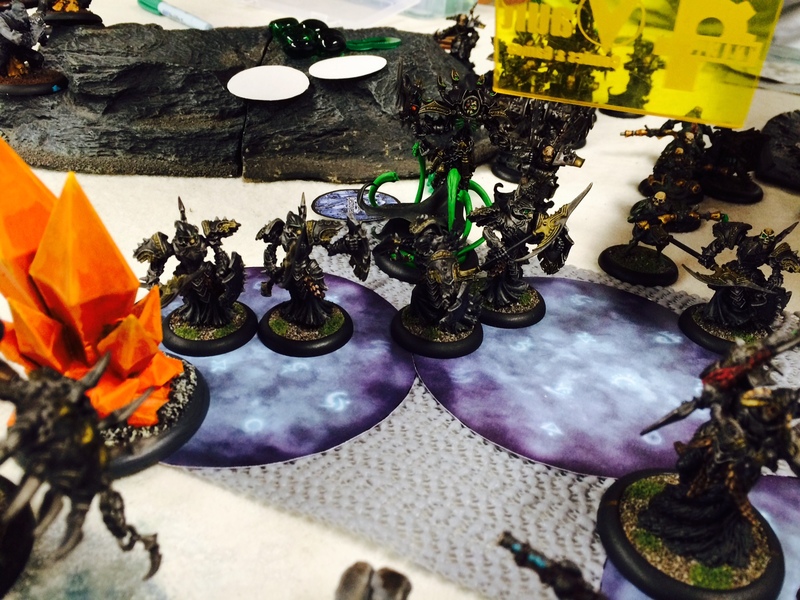 More tournaments like the Goldun Ogruns can only help! While I didn’t win the overall victor, I did manage to win one award: Best Painted Army. I was really pleased about that result, as it wasn’t chosen by the TO/store owner but rather voted on by the other players. It was a little odd winning a trophy that I had made and donated for the event, but I’m still pleased. As I’ve mentioned before, there is an upcoming doubles tournament in my area and my buddy Dan and I are entering as a team. 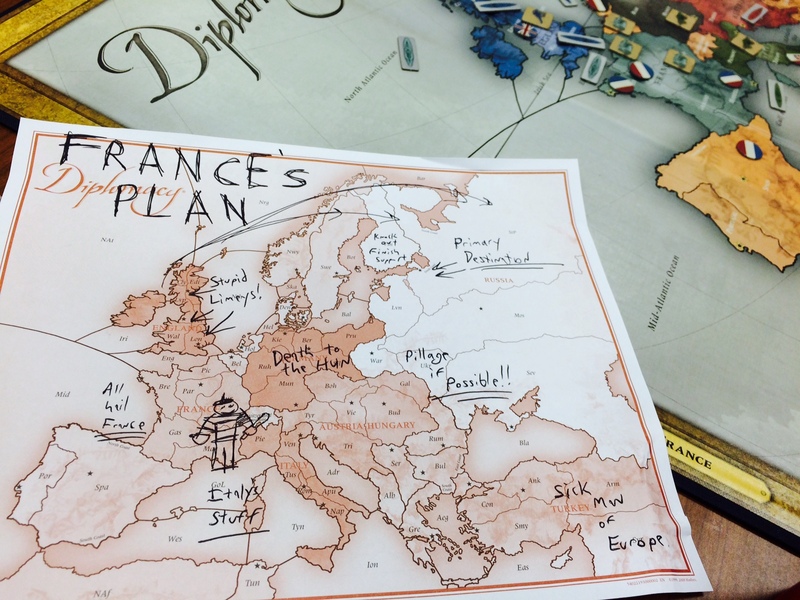 We’ve been playing through various potential scenarios from Steamroller rulesets to get a sense/reminder of them. I’m still on the fence between fielding my Skorne, or making a go of it with my in-progress but woefully under-painted Trollbloods. 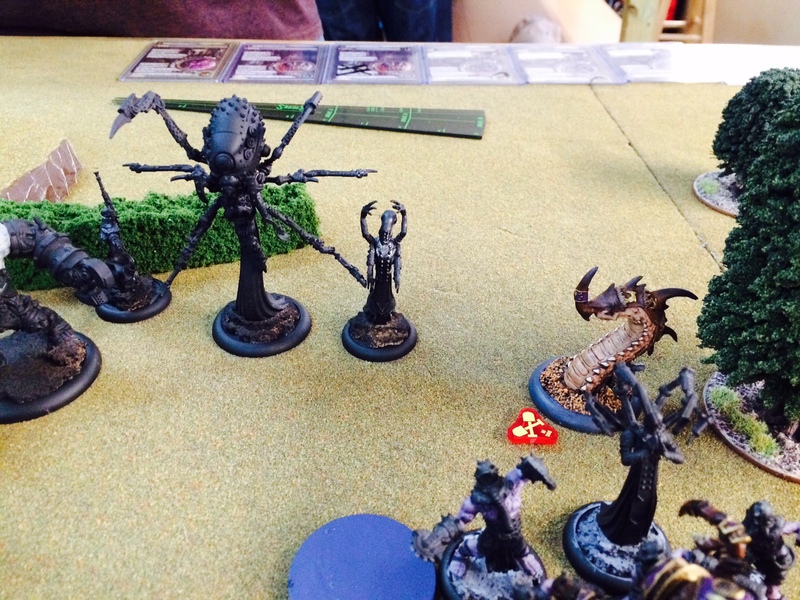 Because of that indecision, for the latest practice games I decided to break out my Legion of Everblight. 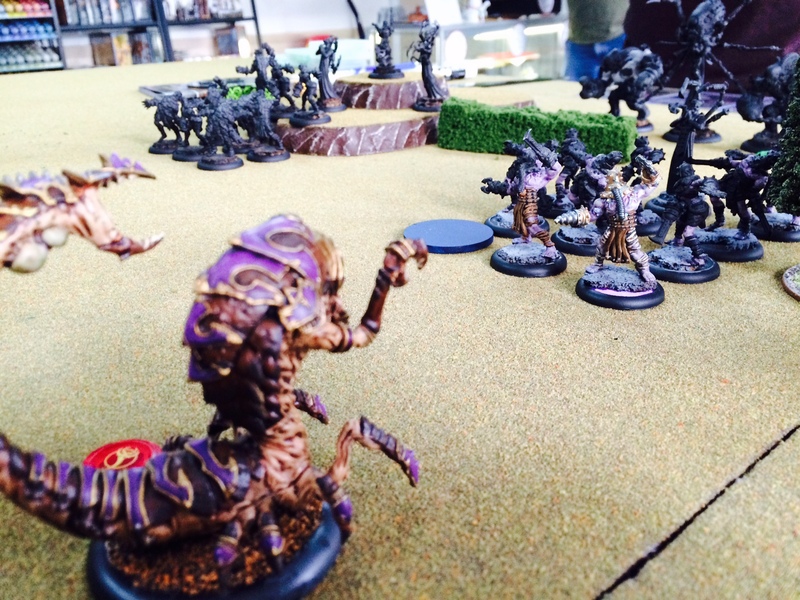 Dan was trying a new Waraster for his Retribution force–Adeptis Rahn–so it was a nice variation for both sides. We settled on small points games to try out two missions in the evening: Outflank with its large circular zones and Fire Support with its flags plus objectives layout. My list was pretty simple: Absylonia accompanied by a Carnivean, a Ravagore, a Scythean, a Shredder, and the Throne of Everblight. His list featured two heavy myrmidons (a Banshee and the character jack Discordia) accompanied by two groups of Battle Mages, two Mage Hunter Assassins, and the Mercenary unit Lady Aiyana and Master Holt. We ended up calling the first game after the top of turn two for a couple of reasons. 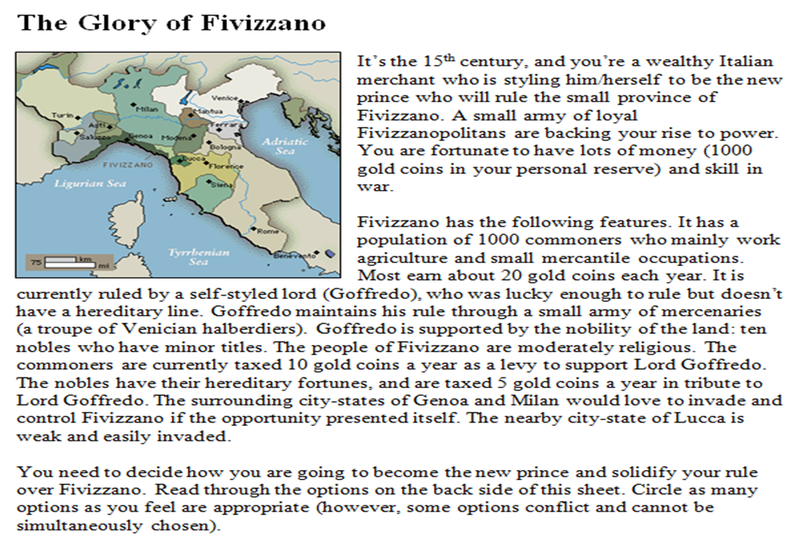 First up, Outflank is probably the most obvious of the missions from the Steamroller sets in recent years. Nothing special, no surprises, just vie for control. Second, because one of his units got too close to the deadly extra reach of the Throne of Everblight and got wiped by an impressive bout of tentacle attacks and an utterly devastating Battle Wizard ability-enabled casting of Spine Burst. That, coupled by the Scythean wrecking a warjack in its alpha strike, made us recognize that it was only going to proceed like this–and not teach us anything about the scenario. 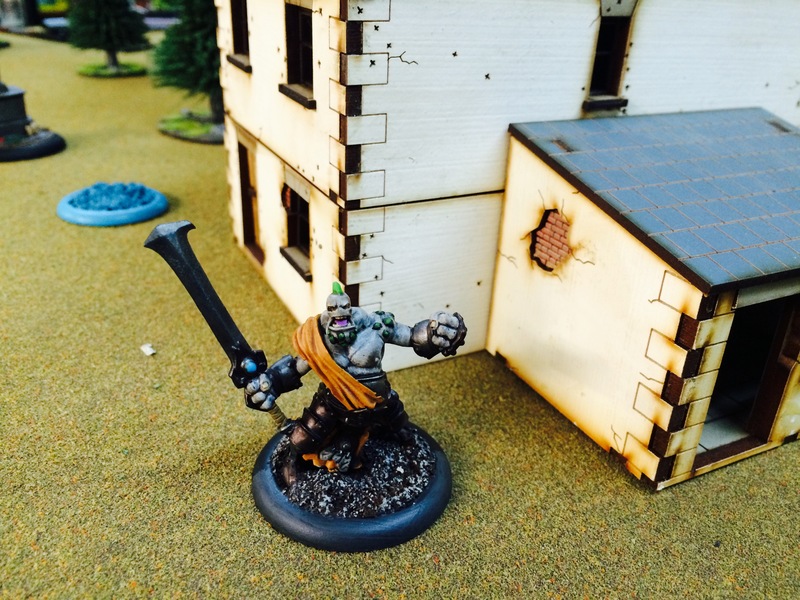 For the second scenario, I swapped warcasters to Lylyth, Herald of Everblight. I’m trying out a ranged-focused caster for another force, so this was a means of giving him a conceptual go without putting him on the table. The Nyss fielded the same force as before. This time the battle was much closer, but I was able to position to a point where it was a forgone conclusion. The sheer amount of infantry-clearing elements that I was able to put out with this group was stunning. I’m always worried with my Everblight, because I go so beast heavy and run hot all the time leaving fury everywhere, but they still manage to do well. When it came to infantry-clearing, I was able to lay down two shots and an Eruption of Spines from Lylyth before she backed away with Bushwhack, the Ravagore’s AoE shot, the Carnivean’s spray thanks to Assault on a charge, and the Throne’s Spine Bursts spell to pile on just a bit more devastation. Having been playing Skorne for a while now consistently, it was a pleasant reminder of just which faction is the shooting faction in Hordes: Everblight can make it utterly rough. Given that the first of the two games was so quickly and clearly aborted by both of us, I’m only counting the second–which was much closer and had Lylyth seriously sweating from the attacks and pressure on her. A bit more practice on objectives always helps, and I know that both Dan and I are looking forward to the event. And for no real good reason, here’s BB-8 on patrol near my display case with Legion in the background.